This is so sweet Kerri!! Love your combo of papers and your design! too cute and gorgeous colors. Have a great weekend! Wow, you're up early! This card is really cute. Glad you found your blingy flourish. It's really pretty on this card. Love the BG paper, too. Awww, I miss participating in Bellarific Friday...hope I can this week! This is just too sweet Kerri! Phoebe is just too darling..and I LOVE those fabby papers you used! I also LOVE the rhinestone swirls, pearls and that fabby ribbon! Oh this is gorgeous! 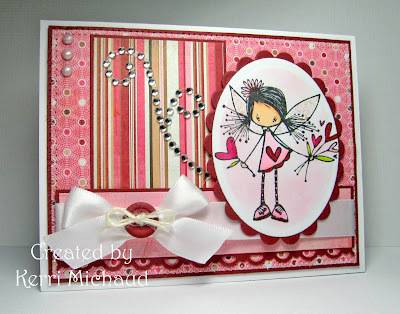 I love that little fairy stamp! This layout is just perfect to let your coloring and that image shine! Wonderful card Kerri! I love the details and the image is super cute. Oh my Kerri this is so sweet! I love the paper too. Beautiful card, I love the image and think I "need" it!! This is cute - love the chocolatey paper you've got in here...yummy - perfect for Valentines. These papers are so pretty together. Love the striped and dots! And that image is darling. Another home run card here!